As part of a series on The Blue Economy of the Great Lakes, NOAA’s Great Lakes Environmental Research Laboratory (GLERL) is featured in a short video, produced by Detroit Public Television (DPTV) and published on the DPTV website. The video, which features GLERL and its partners from the Cooperative Institute for Great Lakes Research (CIGLR, known formerly as CILER), describes the advanced technology GLERL uses to monitor, track, predict, and understand harmful algal blooms (HABs) in the Great Lakes. More specifically, the video focuses on efforts in Lake Erie, where over 400,000 people were affected by a 3-day shutdown of the Toledo drinking water treatment facility in 2014. Since then, GLERL and CIGLR have enhanced their HABs research program—much of which is made possible by funding from the Great Lakes Restoration Initiative, or GLRI—to include cutting-edge technologies such as the hyperspectral sensors and an Environmental Sample Processor (ESP), as well as experimental forecasting tools like the Lake Erie HAB Tracker. In addition to online coverage, the video will be broadcast via DPTV at a future time, yet to be determined. View the video above, or visit http://bit.ly/2pK2g0J. Categories: Communication, Research | Tags: drinking water, great lakes, harmful algal blooms, human health, Modeling, observations, Research, sampling, sensors, technology, water quality | Permalink. How can airplanes help predict harmful algal blooms (HABs)? For several years the National Oceanic and Atmospheric Administration (NOAA) has been using satellites to guide HAB forecasts. But, satellites have their limitations. For example, the Great Lakes region can be cloudy and satellite “cameras” can’t see through clouds. In western Lake Erie there are typically only about 20-30 usable cloud-free images during the HAB season, which limits our ability to make bloom predictions. Another challenge with satellites is that the resolution of images makes it difficult for scientists to “see” differences in the types of algae floating on the Lake Erie surface. After a big rainstorm, for instance, it is difficult to distinguish between muddy water flowing in from the Maumee River and algae that is already in the western basin. The resolution of satellite images makes it difficult to distinguish the types of algae floating on the surface of the water. We can detect different algae in the lake because each algae group (shown above) releases a different color pigment that we can ‘see’/ measure from the hyperspectral sensor. To improve HABs forecasts, during the past two summers, GLERL has been partnering with the Cooperative Institute for Limnology and Ecosystems Research (CILER) and Skypics to use a special hyperspectral sensor on an airplane-mounted camera. This weekly airborne campaign is coordinated with the weekly Lake Erie monitoring program. The monitoring program collects samples at multiple stations around western Lake Erie and the hyperspectral sensor captures images from those sampling stations on the same day. Comparing the field collected samples with what the sensor “sees” helps us to understand how well the sensor is working for HAB detection. Additionally, we coordinate with researchers at NASA’s Cleveland office, who are also flying their own airborne imaging sensor, to cross check our results with theirs for even more robust hyperspectral data validation and quality control. Check out this short video clip of a HAB, taken by pilot, Zach Haslick, from Skypics, as seen from the window of his airplane, while flying the hyperspectral sensor over an area of Lake Erie. Like satellites, hyperspectral sensors collect information on HAB location and size, but since our weekly hyperspectral flyovers are done below the clouds, the images are much higher resolution compared to satellites. Because of this, the hyperspectral sensors provide more accurate and detailed information on bloom concentration, extent, and even the types of algae present in the lake. Hyperspectral sensors measure wavelengths, or color bands, released from chlorophyll color pigments in the HAB to detect color pigments that represent different types of algal groups. The process is similar to how the human eye detects wavelengths to create images but the hyperspectral sensor detects bands of wavelengths, or colors, at greater frequencies than what the human eye, or even satellites, can detect. The pigment detection information helps us determine what type of algae is present within blooms and whether or not toxins are present. In the long run, this will help us develop even more accurate HAB forecasts. Success! This year the hyperspectral sensor detected a bloom that was not detected by a satellite! On September 19, the hyperspectral flyover captured a HAB scum near a drinking water intake in Lake Erie that wasn’t visible from the satellite. Using the hyperspectral images, along with our HAB Tracker forecast tool to assess the potential of the scum to mix down into the lake (see images below), we were able to provide the drinking water intake manager with an early warning of a potential HAB moving near the intake. Hyperspectral sensing imagers offer drinking water intake managers a key resource for identifying the type and location of algal blooms near water intake systems, as was demonstrated on September 19. Now that the field season is over we have begun pouring over our data and will incorporate what we learned to improve our HAB Tracker forecast tool and, ultimately, provide better information to decision makers. GLERL scientists are also teaming up with other partners to test a variety of ways in which hyperspectral sensors can be useful in detecting HABs. In addition to the manned airplane studies, recently, along with a team from NASA Glenn Research Center and Sinclair Community College, researchers flew a UAS (Unmanned Aircraft System) with a hyperspectral sensor over the lower Maumee River/Maumee Bay area in Lake Erie (see the photo gallery above). Concurrently, researchers from the University of Toledo collected water samples for comparison. Not only useful for tracking HABs, this also demonstrates the successful use of a UAS for other types of environmental monitoring. Categories: Communication, Research | Tags: drinking water, great lakes, harmful algal blooms, human health, lake erie, microcystis, Research, sensors, water quality | Permalink. This morning, along side our partners at the University of Michigan’s Cooperative Institute for Limnology and Ecosystems Research (CILER), we deployed the very first Environmental Sample Processor (ESP) in a freshwater system. An ESP is an autonomous robotic instrument that works as a ‘lab in a can’ in aquatic environments to collect water samples and analyze them for algal toxins. This allows for near real-time (only a couple of hours for remote analyzation as opposed to a day or more back at the lab) detection of harmful algal blooms (HABs) and their toxins. GLERL’s ESP—named the ESPniagara—will measure concentrations of Microcystin, the dominant algal toxin in the Great Lakes. It will also archive samples, allowing us to genetically detect Microcystis, the predominant HAB in the Great Lakes, back in the laboratory. There are 17 ESPs throughout the world and the ESPniagara is the only one (so far) being used in freshwater. We’ve placed it near the Toledo drinking water intake in western Lake Erie to collect and analyze water and detect concentrations of toxins that may be a health risk to people swimming, boating or drinking Lake Erie water. We’ll post the data from the on our HABs and Hypoxia webpage so that drinking water managers and other end users can make water quality/ public health decisions. The goal of this research is to provide drinking water managers with data on algal toxicity before the water reaches municipal water intakes. ESPniagara will strengthen our ability to both detect and provide warning of potential human health impacts from toxins. This research proves to be a great collaborative effort for GLERL, CILER, and our partners. The Monterey Bay Aquarium Research Institute (MBARI) first developed the ESP, which is now commercially manufactured by McLane Laboratories. GLERL purchased the ESPniagara with funding from EPA-Great Lakes Restoration Initiative. NOAA-National Centers for Coastal Ocean Science (NCCOS) developed the technology to detect Microcystins (an ELISA assay). NCCOS funding also supported previous work to demonstrate the viability of ESP technology to assist in monitoring and forecasting of HABs and their related toxins in the marine environment. We plan to have the ESPniagara out in western Lake Erie for the next 30 days. Check back later this week and next for a few videos, photos, and some pretty cool data. 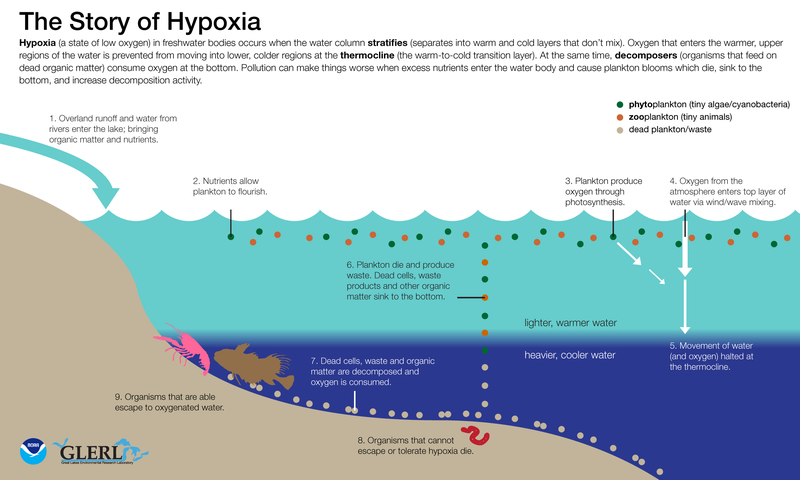 For more information, check out our HABs and Hypoxia website and read up on the ESP. Categories: Communication, Research | Tags: Buoys, drinking water, great lakes, harmful algal blooms, human health, lake erie, microcystis, real time, toxicity, water quality | Permalink.